Apple Inc. sold the highest number of smartphones globally in the fourth quarter, overtaking Samsung Electronics Co. Ltd for the first time since 2011, according to the research firm Gartner. Apple sold 74,832 smartphones to end users worldwide, ahead of the 73,032 phones sold by Samsung, according to Gartner's report. The success of the big-screen iPhone 6 and 6 Plus drove Apple's sales in its first quarter ended December 27. The company reported a profit of $18 billion for the period, the biggest ever reported by a public company, according to S&P analyst Howard Silverblatt. 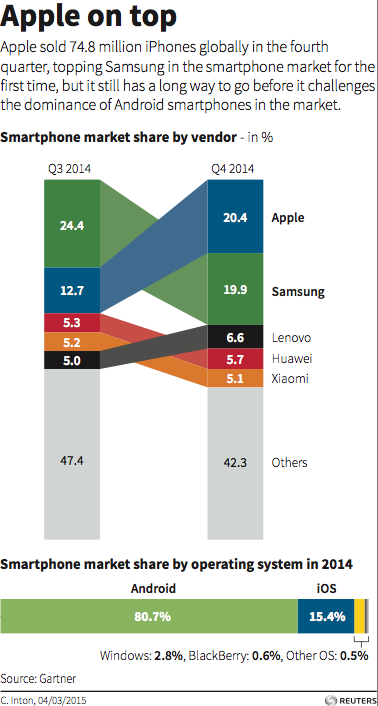 Apple's smartphones sales jumped about 49% in the fourth quarter, according to Gartner. In contrast, Samsung, the market dominator since 2011, recorded a nearly 12% fall. Besides losing market share to the costlier iPhones, the Korean company has been battling low-cost Chinese vendors such as Xiaomi and Huawei. This article originally appeared at Reuters. Copyright 2015. Follow Reuters on Twitter.